The technology, and the world as a whole, is changing at a very rapid pace. The way people communicate with each other has changed a lot in past few decades. With the advent of telephones, mobile phones, computers etc, people started using these channels for communication purpose. Today, these channels are extensively used by customers for contacting businesses and service providers. Today’s call centers need to be intelligent if they want to deliver total customer satisfaction and provide a good customer experience. There are certain features or constituents that must be present in a call center to make it an intelligent contact center. 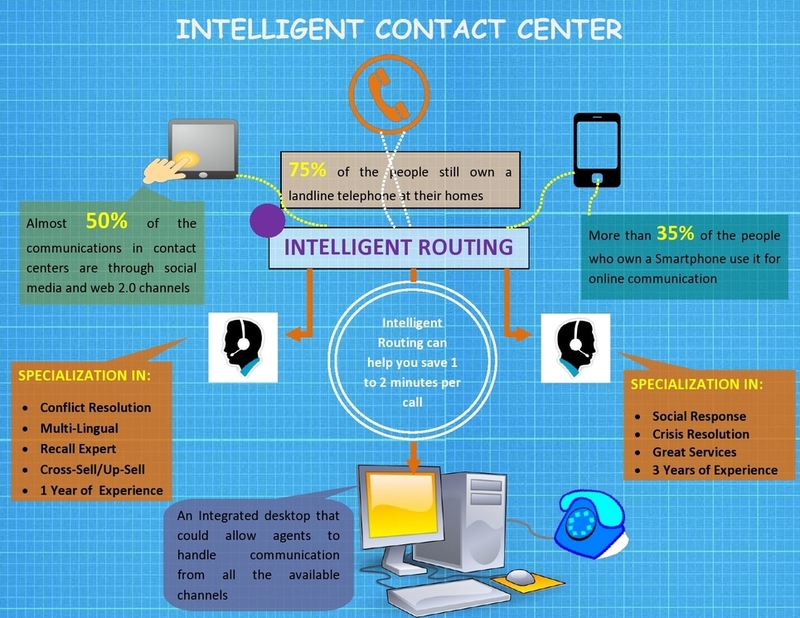 Intelligent Routing:- A highly sophisticated and effective routing system is a must have for every call center today. There are so many channels of communication available to customers that you never know which medium they might use to contact you. More than 25% of the people who own a Smartphone use it for online communication whereas almost 50% of the communications in contact center are through social media and web 2.0 channels. Further, 70% of the people still own a landline telephone at their homes. You need to have a highly sophisticated routing system that could handles the communication coming from various channels and route them to the most suitable agent. Specialized Agents:- An intelligent call center needs intelligent agents who are specialized in certain domains. As each person cannot hold expertise in all the service segments therefore contact centers need to make sure that they have specialized agents for each segment. This would enable them to provide highly effective solutions for any type of query that comes into their center. You might not get expert agents for every service therefore it is also required that you develop strong training programs that could develop such skills in agents. Integrated Desktops:- Agents should be provided with integrated desktops that could enable them to handle communication coming in from various different communication channels. These systems should be able to handle communications from telephones, social media channels, emails and web chat. Users can be using any of these mediums for communication and a contact center should be prepared to assist them in every condition. Other Smart Technologies:- There are many call center technologies that are available in the market and should be used by call centers for enhanced performance. a proper CRM system along with a reliable quality analysis system are some of the technologies that must be chosen properly and used in the most effective manner by call centers. These are some of the key ingredients of an intelligent call center and must be available in contact center if it wants to deliver satisfactory services to the customers. We, at Bluechip Callcenter, have got all these constituents at our global delivery center which makes us an intelligent call center and has allowed us to deliver highly effective and client focused call center solutions tour global clients since our inception. If you have any questions or want to share some of your own thoughts with us then please feel free to leave us a comment below.